We used local block layers for the construction but when we spoke to the client after they lived in the house for a year the houses usually had a 50% higher running cost than calculated. No matter which way a block house is insulated or detailed the best that can be achieved is a running cost of €1,000 per 1,000ft2 and the house gets cold as soon as you turn off the heating. 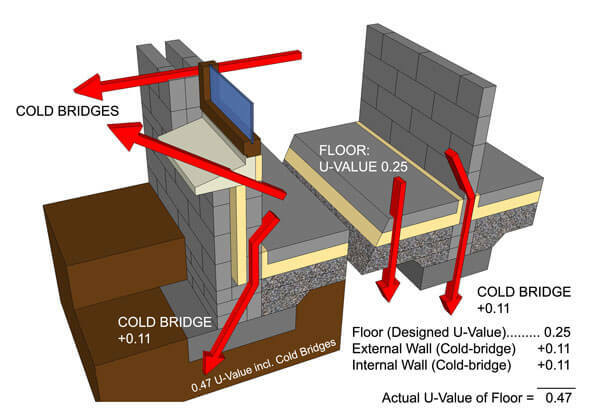 Cold Bridging doubles the insulation value of a block built house, the vast majority of traditional builders have no experience with proper insulation, cold bridging elimination or air-tightness. Its like pulling teeth to get them to change their ways! This National Research Council Canada shows that PU (Kingspan type) insulation loses its insulation value 20 times quicker than the industry admits due to gas equalisation where Pentane gas in the boards gets replaced with air. When within industry accelerated age testing on PU boards is conducted they first seal the edges with Alu foil tape to stop gas migration. Gaps between cavity insulation and the inner block are impossible to avoid because blocks are manufactured with a +-2mm tolerance so 2 blocks beside each other in a wall can have a 4mm difference in thickness and because snots of mortar keep the insulation boards away from the inner wall. 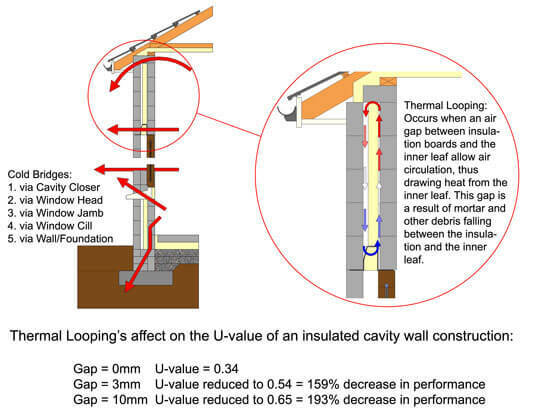 According to the attached Lecompte report "Thermal Looping" in a cavity wall increases (worsens) the U-value by between 150% and 200%. This is easily be identified with an Infa-Red thermostat when a 4 degree temperature difference is detected between the bottom and top of the wall. Blocklayers use Aircrete (Quinnlite) blocks in an attempt to eliminate the wall/floor cold bridge, these have a 3% moisture content and a Lambda (Insulation) value of 0.17W/m.K when they leave the factory. Because of their highly capillary nature their moisture content increases to 15%+ and the Lambda jumps to 0.55W/m.K when used below the dpc, so they're of little benefit over concrete blocks in eliminating cold bridging. Blocklayers use 20mm of dense conductive plaster between the blocks which reduces the insulating effect by a further 50%. Its not possible to air-tightness test a block house until the plastering is finished and its too late to do anything about it, air-tightness in a block built house is a lottery.